We’re in the throes of the winter blues, but that doesn’t mean that you should retreat to the couch under a blanket and wait until spring. We’re all about spending time with a movie or catching up on TV, but after awhile, we get a little bored. Do you have creative or tech skills? Put them to good use. Blogging and content creation via text, photo and video are easier than ever thanks to free resources and on-demand classes you can take from the privacy of your couch. (Shameless plug: I teach on-demand and custom courses in Blogging, SEO, Content Marketing and more.) Use resources like MediaBistro, General Assembly, or Udemy to take online courses to help get you in shape, and then start blogging away. You’ll find tips and techniques for free on places like Pinterest too. It’s not just a hobby for your grandma. 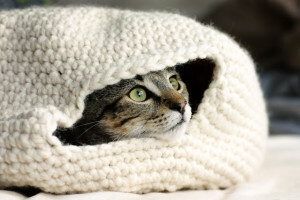 Check out this crocheted hiding places for your cat, for example. If you take a peek, here’s something for everyone out there. Getting fit — even via a trendy workout like barre or spin — no longer requires leaving the house or a Jane Fonda “Buns of Steel” tape. On-demand classes are available for Peleton (stationary bikes) and Physique 57 (barre) as well as more standard workouts like Beachbody and Les Mills. We also love sites like Daily Burn, featuring elite trainers like Bob Harper. Want that community feel? Get a FitBit and compete with friends with challenges to get the most steps or burn the most calories in a week! 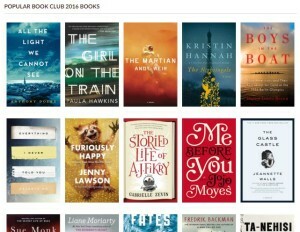 Joining or creating a book club among friends is a great way to stay in touch during the winter months. Pick one night per month where you’ll get together to discuss a book (try these selections to get you started) and rotate homes. Use those “Seen on Pinterest” recipe inspirations to get you started, and don’t forget the wine. Brush up on your cooking skills by prepping everything from homemade bread to your own cocktail infusions. Make a vow to avoid processed foods and try everything from house-made granola to your own goldfish crackers. Have a skill? It can be anything from making jewelry to great scrapbooking skills. Seriously, we even found an adorable purveyor who makes golf club covers that look like your dog. Why not profit from your creative energies? Setting up an Etsy shop is a simple way to make extra cash from your favorite hobbies.